The purpose of the meeting is to discuss with the European stakeholders about the RDA Global and RDA Europe functions and services with a forward looking view and having in mind the discussion carried out during the SyA meeting on the 4th May 2016 (link). This is not a meeting about possible (global nor European) governance models but on the services and functions needed for a strong European participation in teh RDA Global activities. Question: Do you think we need a European RDA support program (RDA Europe) or should we just have the RDA Global? The meeting minutes are available throuh the (link). The RDA Europe deliverables are available in the file repository (link). The sustainability aspects of RDA is now discussed at various places, the US colleagues have created a kind of White Paper (link) about how the funding of RDA US might look like after the NSF funding period will end in 2018. This White Paper has been distributed to a broad range of experts involved in RDA on the US side to open and enable a broad discussion. This meeting is a similar open and transparent approach in Europe to achieve a concencus on how to answer the Work Programme 2016 - 2017 Commission call INFRASUPP-02-2017 (European support for the Research Data Alliance), which is also strongly linked to the RDA Council in general and the European RDA Council members in particular. From the previous meeting we know that Augusto Burgueño Arjona (EC) sees that RDA is a natural part of overall European cloud strategy. The recent cloud communication has many elements that RDA would have expertise and knowledge to offer solutions for. The communication has identified five reasons why Europe is not yet fully tapping into the potential of data (lack of sharing mentality, lack of technology, fragmentation of solutions, HPC needed to process data and the need for closer collaboration) and RDA has potential to tackle many of these factors. From the discussions with Augusto it is also clear that EC would like to move the European RDA support into an "operating grant" in much the same way GÉANT is supported. This is not the case for the upcoming call but the next phase of teh RDA Europe should work towards an "operating grant". Question: Do you think this reflects well the current RDA Europe project work? Contribute to regional meetings to engage experts for example from African etc. Operating the web-site, creation of flyers, distributing updates notes etc. 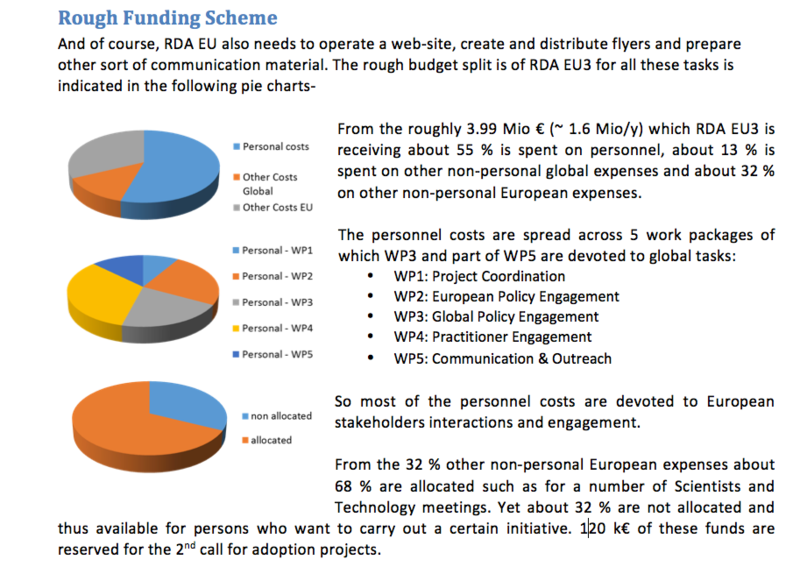 RDA EU does currently not support the work of the WG/IG Co-Chairs and their participation since this is meant to be funded by the projects themselves or institutions. The RDA work must be relevant enough for institutes to send people to the plenaries etc. Currently there is a big investment by the participating individuals and institues in RDA WG/IG in general and the Plenaries and other meetings in particular. Question: Do you think we should European-only activities in RDA or should we just support Europeans participating in RDA Global activities? Are the WGs and IGs working well? How could we support them through RDA 4 so that they work better? Is Secretariat working well? How could we support it through RDA 4 so that it works better? Is TAB working well? How could we support it through RDA 4 so that it works better? Is OAB working well? How could we support it through RDA 4 so that it works better? Is Council working well? How could we support it through RDA 4 so that it works better? Is liaison with scientific leaders working well? How could we support it through RDA 4 so that it works better? Is liaison with e-Infrastructure leaders working well? How could we support it through RDA 4 so that it works better? Is liaison with policy makers leaders working well? How could we support it through RDA 4 so that it works better? Is liaison with funders leaders working well? How could we support it through RDA 4 so that it works better? Is SyA working well? How could we support it through RDA 4 so that it works better? Question: Is RDA Europe 3 working well? How could we change it in the rest of its timespan so that it works better? After processing the input in agenda point 3. things needs to be taken forward. Need for a f2f meeting?, When?, Who? Discussion on what RDA / RDA Europe services and functions are needed for the upcoming RDA Europe call based on the tasks mentioned above and the discussion? Template to collect input for the coming RDA Europe project but also remembering the RDA Global functions is available at the link below. Please feel free to submit your input to the SyA mailing list.